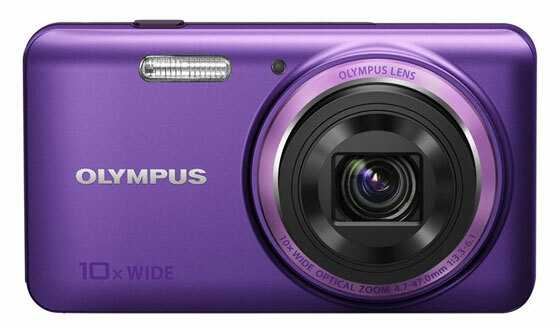 Olympus has announced the release of its new compact superzoom camera, Stylus VH-520. The new model sports a 14MP CMOS sensor, a TruePic V image processor, a 26-260 mm 10x optical zoom lens, a 3" LCD screen, full HD movie recording function, and Magic Filters creative effects. The VH-520 will be available in April in six different body colors. Olympus Smart flagship shoots bright and blur-free, in 1080p Full HD. The compact class has its low-light hero. Semi-pro tech gives VH-520 the edge in the dark. In the new VH-520, Olympus have taken a gorgeously slim compact and packed it full of the technologies, such as low-light iHS, only normally found in much bigger cameras for three times the price. For sheer image quality, the VH-520 is way ahead of the field. Its biggest performance boosters? The 14-megapixel CMOS sensor and a TruePic V processor originally developed for DSLR. Closely followed by the 26mm-260mm* wide, 10x optical zoom lens (20x with Super Resolution Zoom) and lens-shift image stabilisation for taking out blur. When it's dark, ISO 6400 and HDR Backlight Adjustment are essential. For slow-mo movie playback, there's High Speed Movie recording, and Multi-motion Movie IS for shooting video on the go. It all sounds unbelievable that all this technology would be feasible in such a svelte camera body, because normally it wouldn't be. But even in poor lighting conditions, with the Olympus VH-520 great picture quality is feasible. It will cost just £129.99 from late April – in brown, black, white, red, purple or blue. For a camera measuring just 25.4mm from lens to its radiant 3" LCD, the VH-520 really has no right to house components of this quality. Forget the gorgeous design, the sensibly laid-out controls (one-button movie recording) and Magic Filters for stills and Full HD movies. The real magic is in the 10x optical zoom, 26mm wide angle lens. By shaving down the lens set, Olympus were able to replace digital IS with mechanical. Combine that with the high-sensitivity, high-ISO capability of iHS, and you've got a camera that lets you shoot straight from the hip – bright and blur-free, in good or bad light. BestBatt.com is a leading online power accessory superstore. We provide our customers with premium quality camera, camcorder, laptop, SmartPhone batteries, battery chargers, DSLR battery grips, memory cards, power adapters, and other replacement accessories for various electronic equipment. Copyright © 2012 - 2014 BestBatt.com. All Rights Reserved. Powered by Blogger.